RichTextBox is a control that enables you to display or edit rich content including paragraphs, hyperlinks, and inline images. This topic introduces the RichTextBox control, describes some of its features, and shows examples of how to use it in XAML and code. Silverlight includes three core text controls: TextBlock, TextBox, and RichTextBox. The text control that you use depends on the scenario. The following table lists some scenarios and the recommended control. Display formatted text, paragraphs, hyperlinks, or inline images. Enter or edit formatted text, paragraphs, hyperlinks, or inline images. Apply character or paragraph formatting. RichTextBox supports a block-based content model. The content property of RichTextBox is Blocks, which is a collection of Paragraph elements. The Paragraph element can contain elements that are derived from Inline. 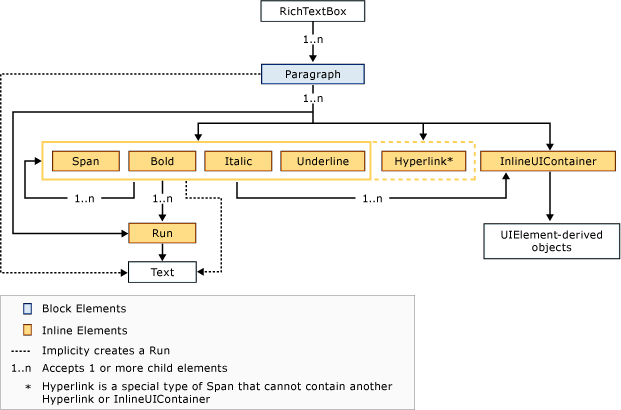 The following illustration summarizes the content model for RichTextBox and shows how elements derived from Block and Inline fit into this model. Block elements are classes that inherit from Block. Currently Paragraph and Section derive from Block, but Section is not a part of the document model of RichTextBox. Like other Silverlight controls, you can create a RichTextBox in XAML or code. The following shows how to create a RichTextBox in XAML and code. 'A RichTextBox with no intial content in it. //A RichTextBox with no intial content in it. The following shows how to create a RichTextBox with a paragraph and some bold text in XAML and code. The VerticalScrollBarVisibility property is set to Auto. Elements, such as Paragraph and Bold, determine how the content inside the RichTextBox appears. As a user edits the RichTextBox content, he or she changes this content. RichTextBox supports hyperlinks. You can use the Hyperlink element to display hyperlinks in a RichTextBox. Hyperlinks provide built-in mouse-over behavior and focus support. Use the NavigateUri property of the Hyperlink element to specify the URL. You must set the IsReadOnly property of RichTextBox to true for the Hyperlink element to be active. The following show shows how to create a RichTextBox with a hyperlink in XAML and code. Displaying text with <Hyperlink NavigateUri="http://www.msdn.com" TargetName="_blank">hyperlink</Hyperlink>.
' Create a Run of plain text and hyperlink. myRun.Text = "Displaying text with "
' Create a paragraph and add the Run and hyperlink to it. // Create a Run of plain text and hyperlink. // Create a paragraph and add the Run and hyperlink to it. You can display a UIElement, such as an Image or a Button, in a RichTextBox. This enables rich text scenarios, such as displaying content from a chat client and showing emoticons. UI elements are active when the RichTextBox is in read-only mode and inactive in edit mode. For example, they can respond to input and receive focus only when they are in read-only mode. Use the InlineUIContainer tag to add content that is derived from UIElement. The following shows how to add an image to a RichTextBox in XAML and code. 'A RichTextBox with an image.
' Create a Run of plain text and image. myRun.Text = "Displaying text with inline image"
' Create a paragraph and add the paragraph to the RichTextBox.
' Add the Run and image to it. //A RichTextBox with an image. // Create a Run of plain text and image. // Create a paragraph and add the paragraph to the RichTextBox. // Add the Run and image to it. RichTextBox has a read-only mode. You can display rich content in read-only mode. UI elements and hyperlinks in a RichTextBox are active only in read-only mode. For example, they can respond to input and receive focus only when they are in read-only mode. You specify read-only mode by setting the IsReadOnly property of RichTextBox to true. The following shows how to set the IsReadOnly property in XAML and code. <Hyperlink NavigateUri="http://www.msdn.com" TargetName="_blank">Hyperlinks</Hyperlink> are enabled in a read-only RichTextBox. myRun.Text = " are enabled in a read-only RichTextBox." You can traverse the content in a RichTextBox by using the TextPointer class and its members. A TextPointer object represents a position in the content of a RichTextBox. The position can either occur between characters in the content, or between the element tags that define the structure for the content. If the position occurs between the characters in the content, then it becomes an insertion position. That is, new content can be added in that position without breaking any semantic rules for the associated content. In practice, an insertion position is anywhere in content where a cursor may be positioned. In most cases, if the position occurs between the element tags that define the structure of the content, then the position is not an insertion position. An example of a valid TextPointer position that is not an insertion position is the position between two adjacent paragraph tags (that is, between the closing tag of the preceding paragraph and the opening tag of the next paragraph). Perform an ordinal comparison of the current position with a second specified position. For more information, see the CompareTo method. Get the TextElement or the RichTextBox that scopes the specified position. For more information, see the Parent property. Translate between TextPointer positions and symbol offsets into content. For more information, see the GetPositionAtOffset method. Find a nearby insertion position, or check whether the current position is an insertion position. For more information, see the GetNextInsertionPosition method and the IsAtInsertionPosition property. For more information see the TextPointer class. You can format text in RichTextBox at the block-level and inline-level at run time. The following example shows how you can right-align the entire contents of the RichTextBox. 'Right-align the content in RichTextBox on clicking the button. //Right-align the content in RichTextBox on clicking the button. A more common scenario would be where you select a portion of the content and then you apply formatting to the selection. A selection of text in the RichTextBox is represented by the TextSelection class. You can access the currently selected text in the RichTextBox by using its Selection property. To perform operations on the selected text, you can use the GetPropertyValue and ApplyPropertyValue methods. The following example shows how to apply bold, italic, and underline formatting to the selected text. It is also possible to select text programmatically. You can select text in a RichTextBox programmatically by using the Select method. The Select method takes two TextPointer objects as parameters and selects the texts between the two objects. The following code example uses the Select method to programmatically select the last word in a RichTextBox and underline it. In this example, a space character is used as the word boundary. This code example is a part of the larger example used in the TextPointer class. Note that The XAML string returned by the Xaml property will not include any UIElement objects that are present in the content. The InlineUIContainer objects will be converted to empty Run objects. The following table lists various elements and the corresponding properties that are included in the string returned by the Xaml property. The Xaml property only supports attribute values that can be represented as a string. For example, to set the Foreground property, you can only use a SolidColorBrush and not a LinearGradientBrush. The following code shows how the XAML is displayed by using the Xaml property. 'set the Xaml back again from the xamlTb to the RichTextBox. //set the Xaml back again from the xamlTb to the RichTextBox. RichTextBox supports the ability to perform multiple undo operations in response to user actions. In addition, an undo operation can also be reversed, which is called redo. When an undo or redo operation is performed, RichTextBox attempts to set the selection state based on the undo or redo operation. Undo is supported only if the IsReadOnly property for a RichTextBox is false. Also, programmatic undo operation is not supported.